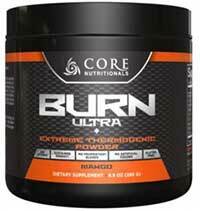 Burn Ultra is a thermogenic fat burning supplement produced in America by Core Nutritionals. The company manufactures a number of other weight management and sports supplements all of which appear to be aimed at people who have more athletic lifestyles than the average person who is looking to lose weight. However, Burn Ultra is only available as a powder, so it has to be mixed with water and consumed as a drink. This is a fact that may deter many dieters from using the product because although bodybuilders and other sporty individuals may be used to taking supplements of this nature such supplements are not as convenient to use as diet pills. What is Burn Ultra and How Does it Work? There is nothing particularly cutting-edge about the formulation. Like most thermogenic fat burners, Burn Ultra contains ingredients that have been chosen for their ability to speed up the metabolism and raise the body temperature by an amount that is sufficient to encourage the body to begin burning fat. Any extra energy the product provides will be largely due to the fact the formulation is loaded with stimulants. Acetyl-L-Carnitine HCI (500mg): According to the authority website Examin.com, supplementation with Acetyl-L-Carnitine may support weight loss, but the effects are likely to be greater for elderly users. Garcinia Cambogia Extract (60% HCA) (250mg): A fruit that provides hydroxycitric acid (HCA). It is primarily used as a fat blocker. Most experts agree the extract needs to provide 60% HCA to be effective for weight loss. The extract used here provides this, so that is a point in its favour, but the inclusion rate may be a little low. Green Coffee Extract (250mg): The active ingredient in green coffee bean extract is a compound called chlorogenic acid that is believed to be a themogenic fat burner. Caffeine (150mg): A stimulant that can provide extra energy and aid concentration and metal focus. Caffeine has also been proven to be an effective thermogenic fat burner. Coleus Forskholii Extract (125mg): A plant extract that is often added to supplements because its presence is believed to encourage weight loss and help protect against loss of existing muscle tissue. Bacopa Monniera Extract (100mg): A plant extract that is often used in traditional Indian medicine. Some research suggest Bacopa Monniera may be useful for treating age-related memory problems, but the reason for its inclusion here is unclear. Advantra Z (50% Synephrine): A branded form of the fat burning stimulant synephrine. PURENERGY (50mg): A patented ingredient that combines caffeine with pTeroPure. According to the manufacturer, PURENERGY is absorbed more quickly than normal caffeine. Theobromine (50mg): A stimulant that is milder than caffeine. It may provide an extra energy boost. Theobromine is also believed to useful for improving the mood. Usage Instructions – New users should mix one scoop of the formulation with 10-12oz of water and consume the mixture in the mornings. An additional serving can be taken 5-6 hours later. If no tolerance issues arise it is permissible to increase the morning dose to two scoops, but the afternoon dose must remain at just one scoop because three scoops should never be exceeded in any 24-hour period. After eight weeks of continuous use supplementation should be stopped for at least four weeks. Core Nutritionals also state the formulation must not be used alongside other foods, products, or beverages that contain caffeine or other stimulants. We were unable to find any customer feedback other than a comment left on the manufacturer’s website by a customer who said the formulation helped to wake him up in a morning and keep him going for several hours. Core Nutritionals point out Burn Ultra is unsuitable for women who are pregnant or nursing a child. The formulation is also not intended for people who are under 18-years of age. All potential users are advised to seek medical advice before commencing supplementation and Core Nutritionals state this is especially important for people who have existing health problems or are using medication. Burn Ultra is available in several flavour choices including mango, peach, and blueberry and green tea. Each tub contains 56 (5g) servings and has a price tag of USD$ 39.99 (AUS$ 55) when purchased from the Core Nutritionals online store. It is also possible to purchase Burn Ultra from SpartanSuppz, but although the shipping charges are less this still may not be the cheapest option because SpartanSuppz are asking AUS$ 79.95 per tub. 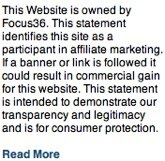 There does not appear to be a money back guarantee. Although Burn Ultra may be able to support weight loss the formulation contains so many stimulants it will probably be more useful as an energy provider and may be a very good option for bodybuilders who are searching for a pre-workout supplement. There are better options available for people who are trying to slim down and lose weight. If it is the fat burning experience you are seeking then PhenQ should not be ignored. 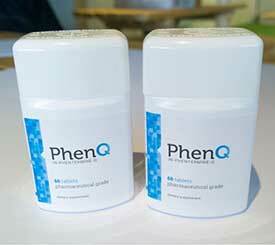 PhenQ is capsule based supplement that contains ingredients for fat burning, fat blocking and appetite suppressing. PhenQ is also very popular in Australia, it has a 60 day money guarantee and ships without a delivery charge anywhere in the world.